The wires are a-buzzing with the sensational news that a 16mm print of a lost version of Fritz Lang’s Metropolis has surfaced in Argentina, which may well be the original cut – around a quarter of the original film is missing from existing prints. The German newspaper Die Zeit has reported the news and published a gallery of startling images from the previously lost sequences of the film. 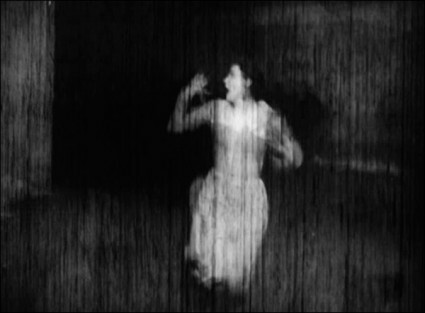 Staff members of the Museo del Cine Pablo C. Ducros Hicken in Buenos Aires, found the missing scenes which had been considered lost up to now, in a 16mm Negative. In addition to this, Enno Patalas developed a study version of the film in collaboration with the University of Arts in Berlin. They supplemented the survived fragments in their original relation to the film in written form or with pictures and musical resources. Because of these survived sources, the hiatuses which weren’t able to be found even after decades of research in national and international Film archives and private converts, were sorely cognizant. Pictures gave us the impression of what was missing – the to a supernumerary reduced figure of Georgy, the man named Slim, Josaphat, the car journey through Metropolis, the observation of Georgy through Slim, Freders delirium of Slim in which he changes into a apocalypse preaching monk. With this discovery in Buenos Aires these scenes will finally come back to life. Even if the quality of the picture is in a deplorable condition, thanks to the Argentinean material, the dream of the completion of “Metropolis” will finally come true. According to Anke Wilkening, restorer of the Murnau Foundation “Hitherto incomprehensible is now intelligible, the sometimes puzzling relations of the figures among each other now make sense.” The story of the instauration can now come to an end. “This sensational discovery places the Murnau Foundation into a position being able to restore the film to a very large degree. That way it could be achieved to come as close to the masterwork of Fritz Lang as never before possible and present it to the world”, says Eberhard Junkersdorf, head of the board of trustees. For the past 42 years the Friedrich-Wilhelm-Murnau Foundation has applied itself to save, preserve, restore and reconstruct a bulk of the German cinematic heritage of 2.000 silent films, 1.000 talkies and about 3.000 filmlets (commercials, documentaries, etc.) from the beginning of film up to the 1960s, trying to make these films accessible to the public. Among films as “Metropolis”, German classics like “Das Cabinet des Dr. Caligari”, “Nibelungen”, “Der blaue Engel”, “Die Drei von der Tankstelle”, “Münchhausen”, “Große Freiheit Nr. 7“ just as a multitude of productions of important German-speaking directors such as Friedrich Wilhelm Murnau, Fritz Lang, Ernst Lubitsch, Detlef Sierck, Helmut Käutner and Wolfgang Liebeneiner. The current extensive restoration project is Fritz Lang’s monumental film “Die Nibelungen” which is planned to premiere with a new musical score at the Berlin Film Festival in 2010. Truly wonders will never cease, and lost films will only remain lost until someone finds them. More news here as it emerges. Update: There’s more news, including a history of the print’s rediscovery and further images, in The Metropolis case follow-up post.